It's no secret; providing food at your health fair is one of the best ways to ensure your employees attend. Not to mention, your employees will highly appreciate it and are going to love you for it! You can use food as a way to bring out those stubborn employees to the health fair. By coming for free food, it's a high chance they are going to visit with vendors and even get flu shots or screenings. All companies are different, and some have a harder time getting employee participation in health-related events - food is a way to change that. Bring out the local farmer's market or local produce provider is a guaranteed, healthy food option that can be easy to contact/invite to your health fair. You wouldn't want to promote this vendor as providing a full meal/lunch, but typically they will bring samples for your employees to try. Not to mention, your employees will be able to buy produce right on the spot or sign up for home deliveries. I recommend going the catering route if you want the utmost certainty your employees are going to show up, as well as you're guaranteed to make a big impression. Your employees are not only going to be impressed, but they are going to appreciate you providing an actual meal - not just snacks. You can go with box lunches, or the buffet style works well for larger employer groups. Believe it or not, the above picture is of food that was provided for free. That's right. FREE. I personally was able to coordinate free food from this vendor for this health fair. So how did I pull it off? Two reasons. 1. The hosting company was a group that catered quite frequently throughout the year. If you're not a company that caters on the regular, you'll probably have to come out of pocket and pay. Either way, catering food for your health fair is the premium option. Now, as you can probably see in the picture above, this is quite a large venue (gymnasium) with a large employee base. It's quite costly and more difficult for large companies to cater their health fair, so providing healthy snacks is an excellent idea. Get three or four fruit/vegetable trays, and you're good to go! These healthy snacks at this health fair were a huge hit, got the job done (meaning, helped bring employees out to the event), and were much cheaper than choosing the catering option. 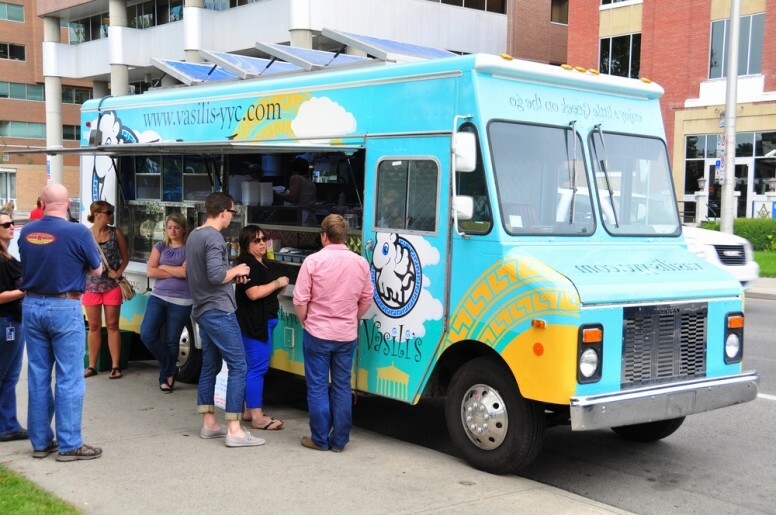 Having food trucks at your health fair is always a great time for your employees and is highly recommended if you have an outdoor health fair. Even with an indoor event, if the venue has close and easy access to outside, food trucks are an excellent idea. 1. You don't have any leftover food - no over-ordering and wasting money. 2. It's zero $$ out of your budget. The employees that want to eat can pay and eat. And believe it or not, there are healthy food trucks out there. Food truck vendors are always looking for opportunities such as an employee health fair, so you should have no problem finding one that works best for you and your employees. However, let's say you have no budget - zip, zilch, goose egg, zero. Don't let this stop you. You can typically find vendors that will bring healthy snacks to your health fair at no cost to you or your company. There are numerous and various types of healthy food vendors who want to share their product and spread the word about what they can offer. Vendors want to spark the interest of your employees and get them talking. The only way to do that is offer free samples. If you lock down two or three healthy food vendors (who offer samples), it typically turns out to be plenty of food, it didn't cost you a dime, and your employees are going to be happy with the vendors you picked. Last and certainly not least, providing a cooking demo for your employees is going to (1) be a monster hit with your employees and (2) you're going to look like a rockstar. The vendor pictured above had a seven-course meal prepared and explained on each course how to make certain dishes more healthy and less fattening just by the way you cook (i.e., Pineapple upside down cake cooked with half the sugar and with one less egg was the dessert). A cooking demo is typically more difficult to find, not to mention, can be a little more costly. However, you have to keep in mind that this more like dinner and a show - it's not just food. 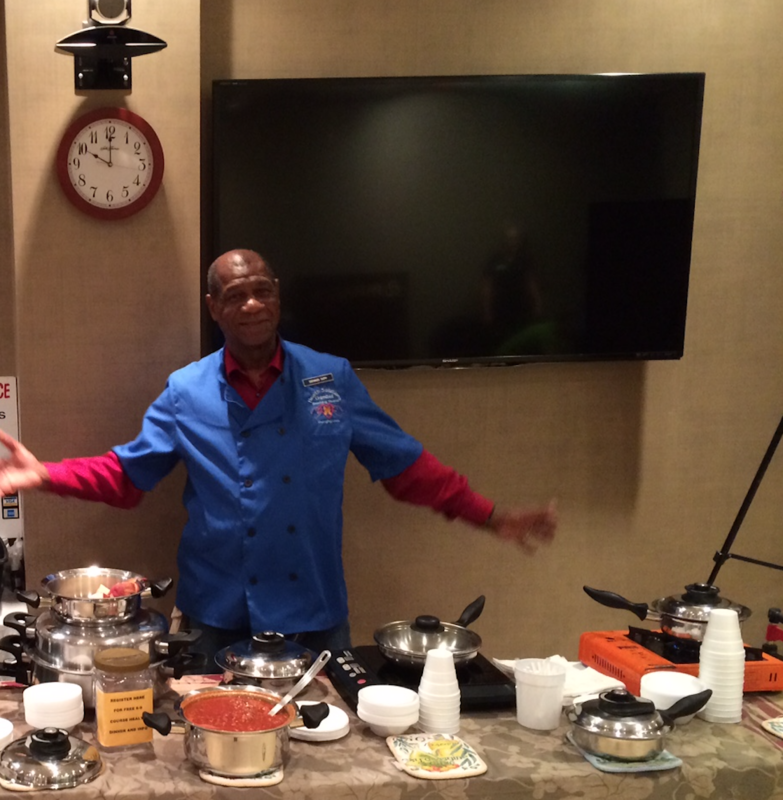 A great cooking demo can have your employees talking about how awesome their health fair was for weeks to come! So, as I mentioned, providing food is an almost sure way to increase your employee turnout. But it can be all for nothing if you make the wrong decision in where you place the food. Do not put the food outside of the health fair venue and do not put the food in the front of the health fair venue. I have personally been at health fairs and have seen these mistakes made. Employees walk in, grab food in the front, socialize for a sec, and leave. Or, they don't even come inside the health fair venue - they just grab a plate of food (which is out in the hallway) and sneak back to their desk. Don't let this happen! At the Randolph County Health Fair in North Carolina, the employees had to get a "lunch ticket" punched by a certain number of vendors before they could get lunch. You know your employees better than I do, but I recommend this option if you struggle with participation. If your employees know nothing about the health fair (much less that there is food provided) which leads to low participation - then that is on you. Don't let this happen. 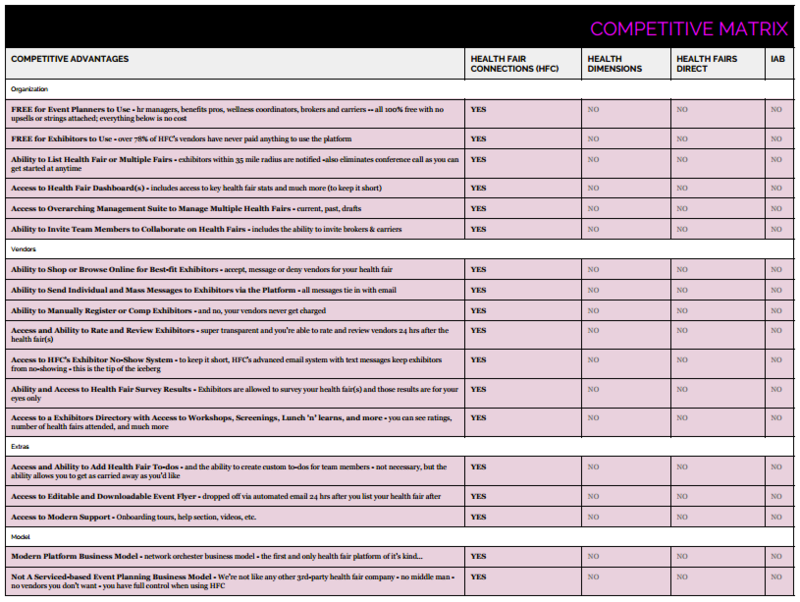 So there you have it, some excellent food ideas/options for your employee health fair. And remember, once you have food, be strategic about the placement.